Choosing a break for Son’s half-term holiday usually involves the pot luck approach. We check out the budget airlines to see where the most reasonably priced flights would take us, make a list and then select. 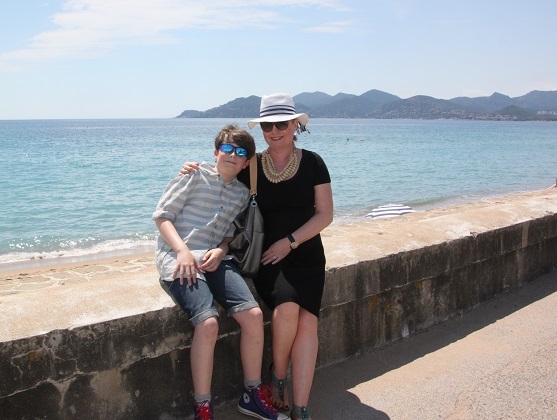 We found some cheap flights to Nice and opted for that – mainly because Son really fancied the idea of staying in Cannes. No great intellectual reason, it was all down to Mr Bean. Having watched Mr Bean’s Holiday where the aforementioned disaster prone character had an eventful trip to the south of France in time for the Cannes film festival, this really appealed to Son so the decision was made. Thankfully our arrival in Cannes was uneventful and bore no resemblance to Mr Bean’s journey. We flew to Nice airport, had an easy thirty minutes drive to our accommodation and arrived without incident. What we did have in common with Mr Bean was the Cannes Film Festival. We arrived on the second to last day and managed to experience the tail end of the glitz, glamour and frenzied activity that takes over this town when that festival is going on. 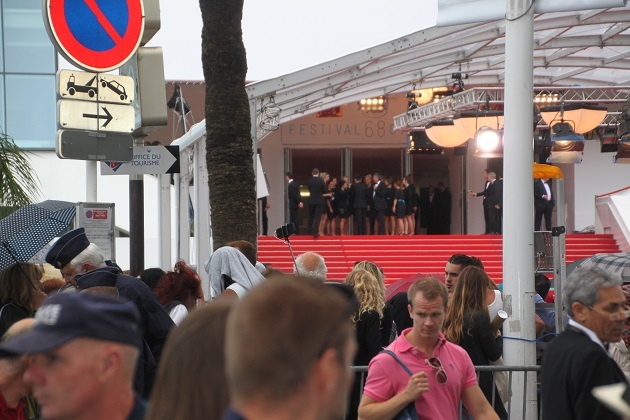 Each May Cannes becomes a melting pot of movie stars, film makers and wannabees plus the old billionaire who all come to town for the 12 day film festival. It attracts the stars but also a serious number of photographers. The buzz is incredible and the people watching is something else. We had a stroll by the harbour first of all and admired the yachts in the Vieux Port – plenty of excess on show. 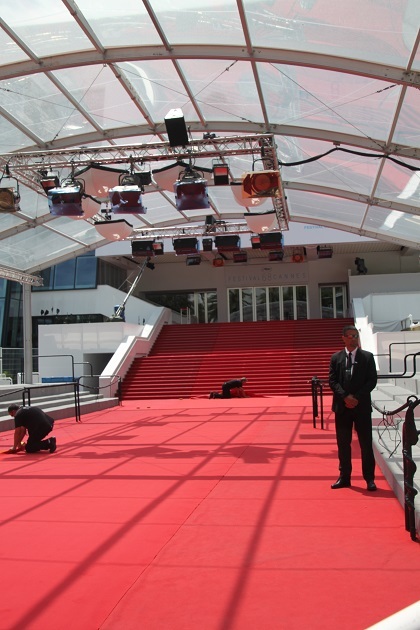 The Palais des Festivals is just around the corner from the harbour – host of the film festival but not particularly attractive from the outside, we saw the red carpet rolled out and waiting for the last night of the festival. Apparently you can take tours, tread the stage and walk down the auditorium – just not when we were there. Plenty of suited security men keeping an eye on things and even at 2pm in the afternoon crowds of people pitching their front row spots for star watching. 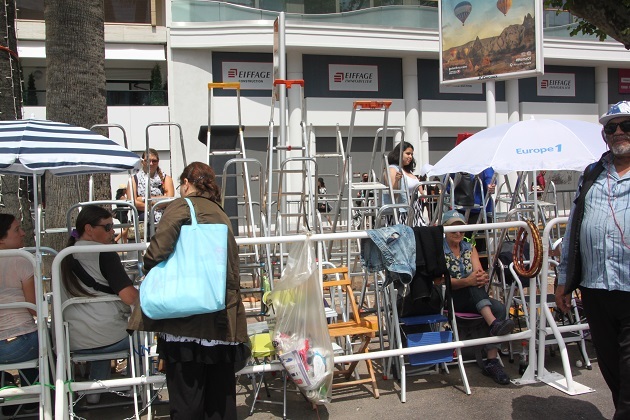 Son was amazed too at the number of stepladders all lined up and paparazzi with huge cameras getting ready for the evening’s activities. We just contented ourselves with posing for pictures near the 22 steps leading to the entrance – early in the day you could get close, by 5pm there was no chance. 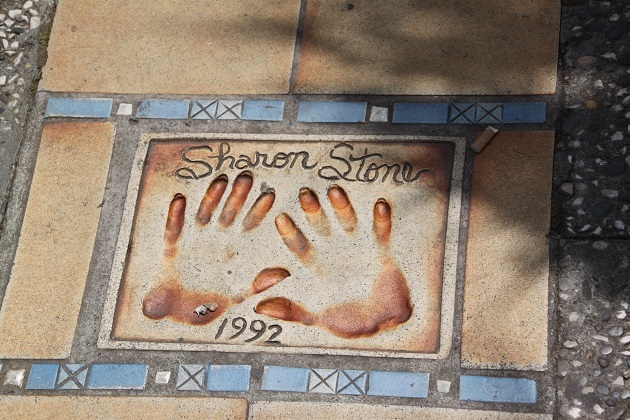 We wandered down Allee des Etoiles du Cinema where we ran into Sharon Stone and the Pink Panther and other icons of the silver screen – well at least their handprints and signatures in the pavement. A walk down the Croisette – the glamorous seaside promenade is a must do. This is the most famous street in Cannes, it curves along the coast and is lined by grand hotels and exclusive private beach clubs. 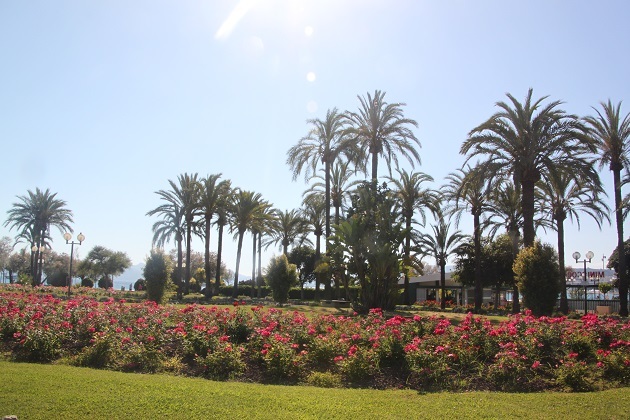 The palm shaded promenade was a hive of activity – the Art Deco and Belle Epoque hotels are impressive but so too are the views of the lovely bay and the mountains. 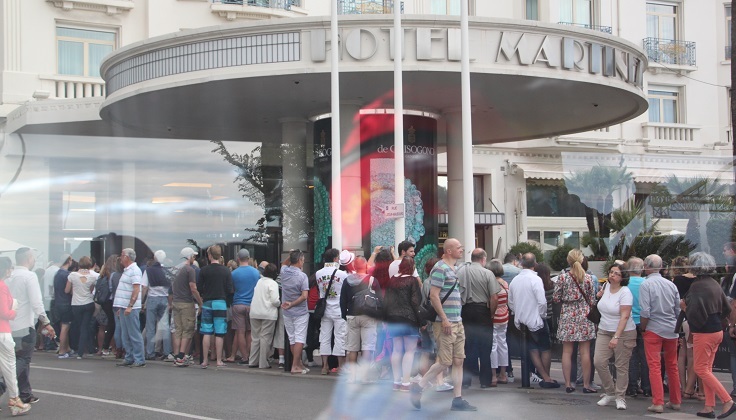 All the way down the Croisette at some of the swanky hotels people had also gathered round the entrances, kept behind ropes but straining to catch a glimpse of a movie star. 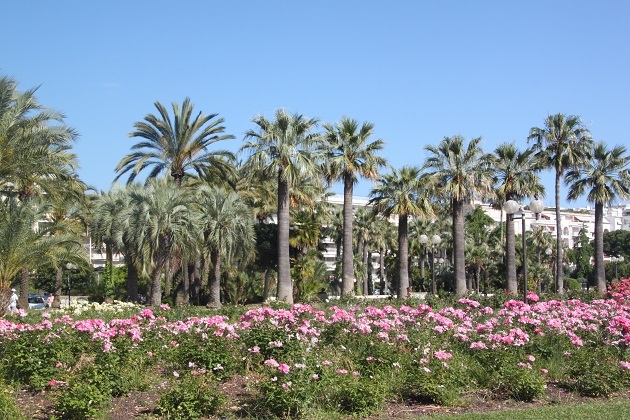 We strolled taking it all in, had a rest in the lovely rose garden at the end then walked back to the Palais des Festivals where everyone’s attention was gathered that evening. On the way past the Festival Hall we saw huge crowds and couldn’t even get close. Still, at least we’d experienced the fringes of the Cannes glamour for the film festival. It must have been interesting to see all the behind the scenes activity and the media machine involved in such a festival. I hope there was no disruption to your plans because of it. Accommodation was a bit tricky to find, but we got an apartment slightly further out which actually worked out to be perfect. Apart from that though everything was fine for us – we arrived right at the end though, probably the best time just to catch a flavour of the whole thing but then to see Cannes get back to normal again. Looks like a lot of fun. I would love to do that some day. Highly recommend it – so much to see and take in and the atmosphere is incredible. Your son looks like a movie star himself with those shades on! So glad you all had a good time, looks like a great place to visit. Ha – he can try!! It was a great experience and we all loved our time in Cannes. Awesome 🙂 Hope to go there some day. It’s so beautiful and so much to see in the whole general area as well, we loved it. Ahh, the joy of travelling..:)I find it amazing that your son loves all this..How old is he? most nearly teens would love to go to the hype-much theme/game parks & adventurous itinerary. But this place is indeed a stunner. I hope to visit this place with my family too. Thanks for sharing! 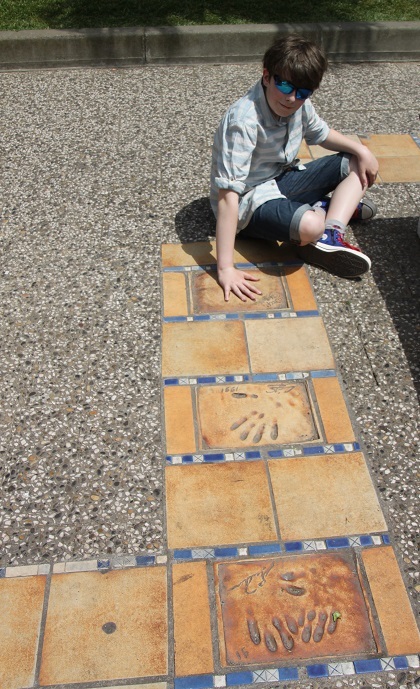 He is 12, loves theme parks for sure but also loved it here!! Cannes looks beautiful! The festival sounds interesting as well. It is a gorgeous city in a superb setting, the festival was great to experience even if we only caught the tail end of it! 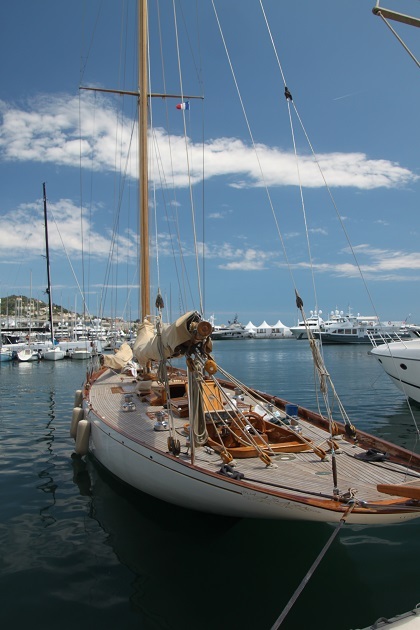 Your lovely photos and narrative brought back memories of our visit to Cannes when we were staying in Nice. We went there for a week one Easter and ended up staying two weeks as we got stuck with the volcanic ash cloud – not the worst place to get stuck though! It looks much sunnier than your Welsh weekend!! I remember that ash cloud – my parents were visiting us and ended up staying a couple of weeks as well!! Like you say though, worse places to be stuck than the South of France for sure. The weather was glorious – Wales at the beginning of the month and Cannes at the end – what a difference in terms of sunshine! Cannes has always sounded so glamorous to me – I can imagine it was super fun experiencing all the glitz and glamour! Too funny about Mr. Bean. I always think of him in Love Actually, one of the best scenes of the movie:). We had such a great time and arriving at the end of the film festival was very exciting – all inspired by Mr Bean!! Sound really cool and looks like you have a great time! It was great, we all loved just about everything about it too. So happy I found your blog. 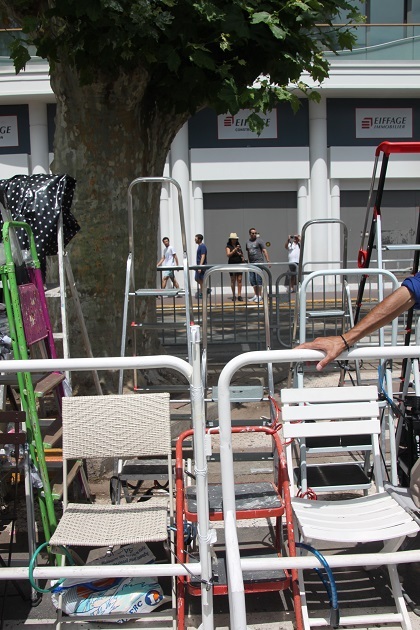 As familiar as I am with Cannes (my husband’s aunt was the actress Daniele Delorme married to Yves Robert), and the family stories of the film festival, it’s always great to just read about normal Cannes. That’s what I love about the area. We stay every year and love it.. Thank you for a sweet post with great, GREAT pics! Thanks Catherine for your lovely comment and for coming by my blog!! 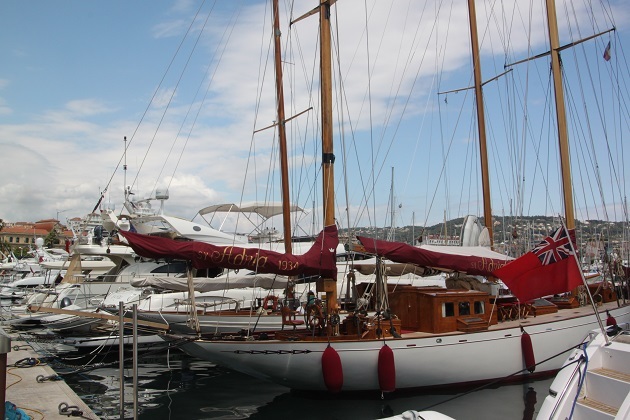 What a great family connection to Cannes – makes it extra interesting for you. We loved staying here, found a great little apartment a bit out of the centre but it gave us a real feel for what normal Cannes was like! It was a really great experience to catch the end of the festival, we didn’t time our visit specifically for that, but like you had heard so much about it that it was great to see what it was all about. We’ve done that in the last few years – ended up in Iceland, Cinque Terre and now Cannes – highly recommend!! I won’t tell my son – he’ll be so jealous!! I know exactly what you mean about those accents Rosemary – can’t figure them out here at all so I just leave them!! We had a lovely time, great weather and did loads of exploring so have plenty to write about – just need to get around to it!! Hope your weekend is a great one too. You’ve reminded me how gorgeous the south of France is, and how cheap it can be to fly to Nice. I’m off to check skyscanner – merci! Good luck – hope you find something!! I’ve never been to Nice but I’ve heard a lot of good things about it ! It looks very nice and the vieux port looks awesome ! I hope you went there before the terrorist attack 😦 So scary what happened there ! We did visit before that, really hard to take it all in actually, such a terrible thing to happen in such a wonderful city. We spent a day in Nice and loved it. 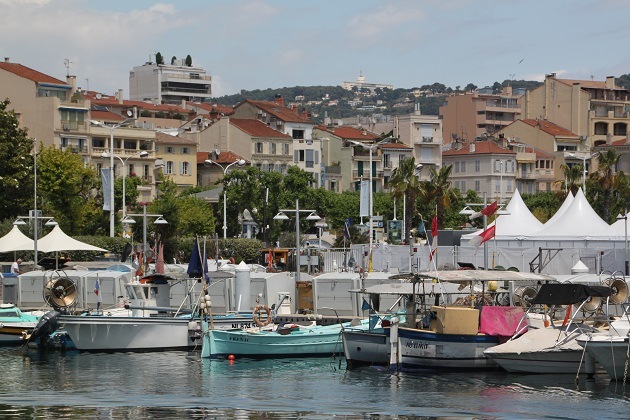 Cannes was a great place for exploring the wider area we found, we used it as our base and had a day or two there but found it convenient for going further afield. I know exactly what you mean about the attacks, can hardly believe what happened in Munich, I spent a year there as a student. Like you say Anabel, even sadder when you know the place. 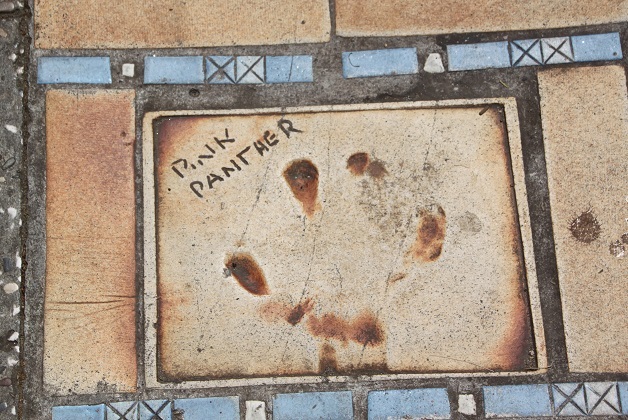 We loved Cannes and the whole area Pam – got to spend a day in Nice as well which really impressed us and made the sad events there recently even more real to us. Now Munich…. I love France! It was wonderful to see Cannes through your photos and narrative! Thank you Lori – we had such a great time in Cannes, every second was an experience. It was such a lot of fun – all the photographers and people milling around to catch a glimpse of a movie star, something totally different for us! Cannes is such a lovely place! It must have been great catching the end of the festivities! I remember visiting a few years back, preferred Cannes to Nice- especially the sandy beach and old port area! We had a day in Nice and enjoyed it there but found we did prefer our base to be Cannes, it has a completely different feel!! The festival, although we only caught the tail end was such a fun experience too, the icing on the cake. We try to fit in as much as we can anywhere we go George – there was so much to fit in here!! It’s so gorgeous, all those pastel shades and lovely buildings, we loved it.